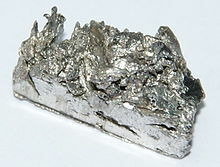 Ytterbium is a chemical element wi seembol Yb an atomic nummer 70. It is the fowerteent an penultimate element in the lanthanide series, or last element in the f-block, which is the basis o the relative stability o the +2 oxidation state. Houiver, lik the ither lanthanides, the maist common oxidation state is +3, seen in its oxide, halides an ither compounds. In aqueous solution, lik compoonds o ither late lanthanides, soluble ytterbium compoonds furm complexes wi nine watter molecules. Acause o its closed-shell electron configuration, its density an meltin an boilin pynts differ frae those o the ither lanthanides.